To all of my wonderful planners! It's a new year with lots of planning to do. 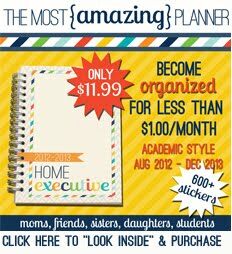 I apologize that I and all of my vendors are completely sold out of the 2012/2013 planner. I have a planner in the works for 2013/2014 which we will update you on through the blog and Facebook. We are having a new baby this week and so I am taking a blogging break for the next while. I will be back online when next year's planner is close to coming out. I hope you all understand. 1. Can you please print more 2012/2013 planners? No, I can't. I am so sorry we are sold out. I print the planners in China; if I had more planners printed they wouldn't arrive for a few months and the price per planner would be too expensive for buyers like you. 2. Will there be a 2013/2014 planner? I hope so. A planner is in the works, however, I am exploring some new options and will update the blog and Facebook when plans are more final. 3. Can you design a planner that runs from January - December? At this point I can't print two separate planners. The most requested style is Academic August-August. Hopefully in a year or two I will be able to expand and print multiple styles. I think that's about it. Thank you for all of your support. Good-bye for now. Happy Planning! 2 comments on "Sold Out for 2012/2013 & Taking A Break"
oh- Happy baby!!! Enjoy your time with your sweet new one... thanks for taking the time to respond!